THE PREDICTION of food behaviour and texture is of great interest to the food industry, and can play a vital role in the success of a product. Those involved in this tricky type of analysis might be well advised to check out the latest application notes from Brookfield Engineering Laboratories, which discuss easy test methods to capture the sensory properties of foods. Put simply, texture analysis is the measurement of the mechanical properties of food as they relate to human senses. The viscosity or thickness of a food, its chewiness, and its smoothness are all important. 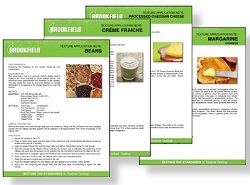 The Brookfield library of food texture application notes is a useful resource for texture analyser operators, QC technicians, and lab supervisors looking for ways to improve quality control in food product and predicting the way food behaves for the consumer. For example, notes include discussion of how curd characteristics can be used to predict the hardness, smoothness, and crumbliness of soft cheeses. A simple compression test can determine how firm or mushy peas will seem, when served. A straightforward sample test can be used to determine the spreadability of a margarine.